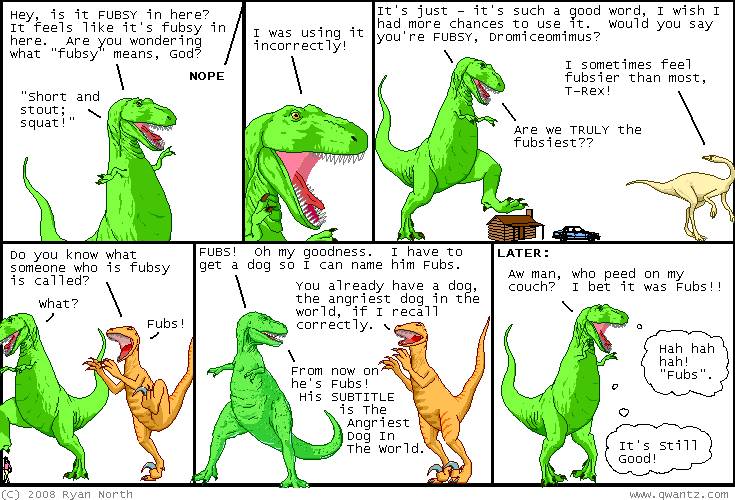 Dinosaur Comics - October 1st, 2008 - awesome fun times! –Coming to this class was an important first step! October 1st, 2008: This seems kinda publicity-stunty, but Collins has come up with a list of words they're going to drop from their dictionary. Not the dictionary, their dictionary: we all know the dictionary is the OED. But in any case, a news story with a list of awesome words facing extinction (from the print edition) (of one dictionary I've never read) was STILL too much to pass up. I call "fubsy"! "Compossible" is also a great made-up sounding word that I hope to work into my speech from now on. I think doing this while still being understood is... compossible? In any case, Collins said they'll be monitoring the media for use of these words, so check it out, Collins! I HOPE YOU READ WEBCOMICS? ?